Discover our extensive Lock-out / Tag-out solutions! Lock-Out / Tag-Out is the fastest growing accident prevention initiative in modern industry and the common workplace. It’s a legal requirement in the USA but it is now being widely seen as common sense and essential in Continental Europe. 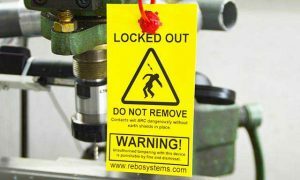 Locking out all possibilities of starting or energizing equipment during maintenance and re-enforcing this locked out condition with a visual warning is at the heart of the process. Tags come pre-formed, hole punched and perforated, ready to use, or on a continuous roll – giving both speed of creation, convenience, cost control and total flexibility. Immediate improve the effectiveness of your LockOut-Tag Out investment and add on-demand solutions to your label, cable and technical ID challenges. 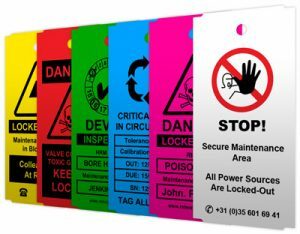 Our materials are designed to give immediate improvements to your Lock Out – Tag Out programmes; producing ‘customised’, colour coded tags that clearly identify specific risks and give you the capability to customise your Tags to be more effective, more flexible and convey a stronger safety message.